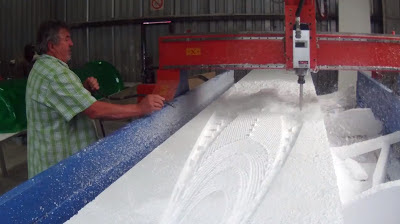 We come to the second part of our interview with Brett Challenor, founder and boss of Stealth Kayaks, South Africa (if you missed it, check out part one where we discuss more general aspects of kayak design). Once again we throw in a few questions from members of the Anglers Afloat forum. In this part, Brett talks in detail about the new Pro Fisha range and how the kayak achieves its impressive strength to weight ratio. We discuss whether Stealth were influenced in the design of their fishing kayaks by the UK's best known high end fishing kayak, Kaskazi's Dorado. Brett has some surprising things to say about the Dorado's success in South Africa and talks about why he feels it was never designed from the outset as a fishing kayak. We discuss if there are height restrictions on the Pro Fisha and Brett reveals that Stealth have another model in the pipeline for the Pro Fisha range that will be designed specifically for bigger guys. We go over some of the options for fitting fish finders and other accessories such as tackle trays and bait boxes. Finally, we address that all important question of whether there's a need for a back rest in the Pro Fisha! We've now got a few questions relating specifically to the Pro Fisha 475 and 575, because this range of kayaks seems to be generating a lot of buzz in the UK at the moment and I know there's a big container of both sizes coming over very shortly! Let's start with the design of the Pro Fisha. The rear of the Pro Fisha, especially the 575, looks to sit quite low in the water, how does that affect the yak catching the wind? Not at all. Obviously the rear sitting a little low in the water has a got a lot to do with your weight distribution and also the rocker of the kayak and the volume of the tail. But in relation to the wind, that's not going to make a difference. What'll make a difference is the front or nose of the kayak into the wind, that's where you catch the wind, not from the back. Does that mean when you're fishing you swing round with your back to the wind? Yeah, you know, a Pro Fisha kayak, you'll always know that the kayak will sit tail down a little bit more? That suits me, my Scupper Pro tends to sit side on to the wind and it can be annoying on occasions! 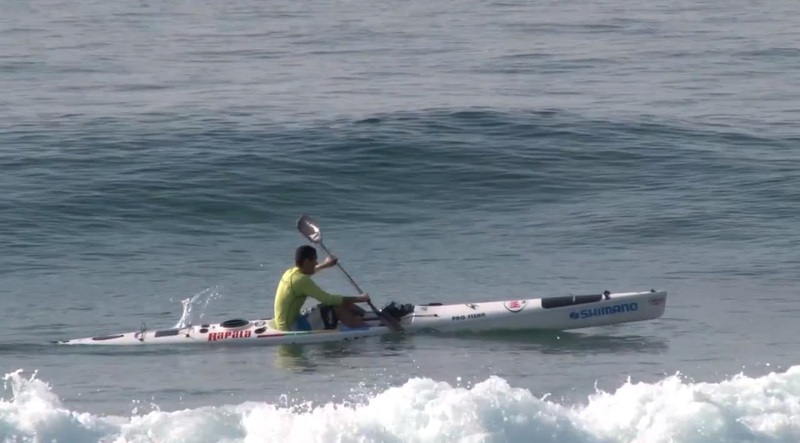 Nose up, sprinting to catch a wave on the Pro Fisha 575. The reason is if you add fish, or add tackle, or anything onto the [Pro Fisha] kayak, the easiest place to put is in front of you, between your legs, because that's where you can see it, so if you... imagine you make a kayak that's got more volume in the tail than the front, then you keep adding all the weight to the front, what'll happen is that the kayak tail will sit higher than the nose, because you're adding weight to the front of the kayak. So your fishing kayak is actually designed so that if a guy catches a big fish, it'll always be in front of him and that will compensate for the lack of volume in the tail. Ah, that's very interesting. 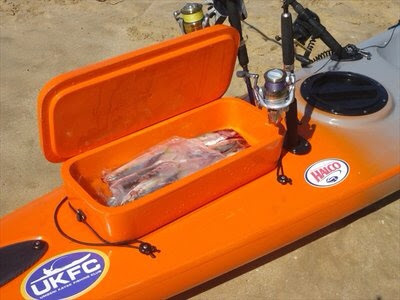 I had wondered about the change in weight distribution in the kayak once you start to add fish. You've recently upgraded the design of the Pro Fisha range, was that after feedback from anglers? No, we were always going to do that, but listen, we work on feedback flat out, I mean the more feedback we get from customers, the better. Fishing is really our hobby! We try to give guys what's best for them. The Pro Fisha range came from a range called the Fishas, which we were quite hybrid between fishing ski / surf ski and the longer the ski the faster it goes. So we thought, like, let's make one that goes as fast as possible, and that's where you need the length [for the 575, which increased in length]. So after that, we thought well, not everyone wants speed, some people want more manoeuvrability in the surf, and the 575 doesn't fit in their garage! Common complaint over here too! And that's where the 475 came about. OK, we have a question from forum user jasondstub: How much faster is the 575 than the 475? Fast? I don't know if fast is really the right word, because I can paddle the 475 as fast as 575. But to keep it going the same speed for a long period of time, I can't do that. So the 575 has a distinct advantage where once you get it up to 11 or 12 kph, then you keep it going at that speed, for.. let's say 20 minutes [ah hem! Don't try that at home kids, we're not all ex-pro racers!]. You can do that with the 475, but you could only do it... for, say 5 or 6 minutes. So it's more to do with the effort to keep that speed up that makes the difference. The two Pro Fishas in action. Equally fast, but only over short distances! And we have another question from jasondstub: Is hull slap quieter on the 475, as it's got less volume in the bow? It is, because of its length. Obviously when you climb away in a longer kayak then there's obviously more kayak in front of you to come down and give you a little hull slap. But it depends on the conditions. If you get a wind where you get where there's what we call a "short chop", then the 575 will be better than the 475. But then you get what we call "long chop", then the 475 will be better, because obviously the gap changes between the waves. Yes, there's been that debate between some of the guys in the export countries, between one or two of them there's been that debate. But it's also depends on what the guys are used to, eh? ...so they became established as a brand leader in the market over here? Yeah, yeah. Well, unfortunately they don't even exist here [in South Africa], when I say they don't exist, you don't see them. I think they've actually done better in the international market than the domestic market. You just don't see them in the water here. I mean, in KZN where I'm from and where our factory is, if you saw one, you'd go "oh my goodness, what's that?"! KZN being the place where most people are kayak fishing, out of South Africa, that is. We can change that, no problem! [laughs] Not at all! It's funny, you don't see it at all. We know that it's here, because of the guy in Cape Town who makes it. But we take what we've designed and try and improve it, rather than look at someone else's. Really, you never looked at it? Never seen it? Oh we've seen it. Probably the last time I saw one was two years ago. Do you know where the Dorado design actually came from? The Dorado was a sea touring kayak, made by a guy called Leon, from Cape Town with a company called Coastal Kayaks at Sea Point, and they used to do kayak tours, paddling around. I used to supply them with surf skis, and he got into a conversation with me one day, and asked about the fishing kayaks because there was a big market in KZN, and he asked me how we did the hatches, and blah, blah, and so on, and I told him because he said he wanted to make one, and he took his most successful touring kayak, and he stuck a hatch in it. And that was how the first Dorado was ever made. OK, well, fair play to him! Well it's only been tweaked slightly from there, so it's always been a touring kayak that's been adapted for fishing. It was never purpose made for fishing. He's obviously... with his demand from the overseas market he's fine tuned it in the last few years, but it was never designed originally for fishing. Right, well it seems well liked over here, so I'm sure that'll start a debate! OK, now a question from forum user fishboy: Is there any height restriction on the Pro Fisha range? Er, you can only adjust the pedals up to a guy 6' 3" / 6' 4", it depends on how long the guys legs are, might be a little more. Right, I've got a mate who's thinking of buying one, and he's 6' 4"! Yeah, look it's easy to check. You can check when you're sitting and measuring your comfort of leg length. So you're sitting at the right angle,and you measure from your heels to the base of your back. That gives you a measurement and you can see if it'll fit. Is that a measurement that someone could send you and you could see how it fits? If a guy gives me his inner leg measurement and his hip (from his ball joint) to the floor, I can do a cross check for him. No problem. There is actually a third Pro Fisha model to be launched at the end of this year, which is due to be an in-between model, between the 475 and the 575 in length, designed for the really big guys who are quite heavy, and they're a bit tentative on the Pro Fisha range, and they want a little bit more stability, bit more volume. We're still playing around with the design on the computer at the moment. The Pro Fisha seems extremely lightweight, even compared to carbon fibre yaks. Is there a risk that it's a weaker yak compared to heavier models? So, the Evolution and the Pro Fisha, you're going to say they've got the same strength and robustness? No. The Pro Fisha's stronger. Really? That's incredible, given that the Pro Fisha is 5kg to 6kg lighter for the same length than the Evolution? Yep. We were having a conversation about this the other day, that the strength of the Pro Fisha compared to the Evolution is quite remarkable, purely from the resin systems and what we're using. It's got its downside, it's more expensive, but it is really strong. We haven't had any major problems, or even anyone who's managed to put a hole in one yet! We've had damage like gelcoat, from a guy going over the rocks, but we haven't had any issues as yet with the strength of the kayak. Could you explain a little about the manufacturing of the Pro Fisha, and what separates it from other glass yaks? First of all my dad designed it on the CNC machine using CAD and Rhino software, so that every part of it is true. The left and right sides are exactly the same, they match perfectly. Traditionally, say 5 years ago, the guys did this by hand like they do with surf boards, they were hand shaped and each side was slightly different. Obviously with the computer you get a much truer kayak. From there we use the CNC system and the CAD to do a lot of our internal strength and structure of the kayak, where we've used the computer to design our foam stringers, it cuts them and designs them, so that the whole kayak fits together like a puzzle. The kayak fits together a lot easier than if you'd done it by hand. For example, the fish box of the Pro Fisha is put together so that the foam supports it. 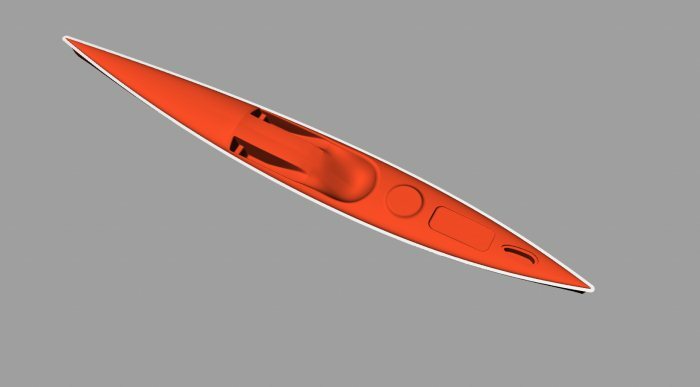 The kayak is designed using CAD software, which then creates cutting templates for the CNC machine. Whereas with the Evolution, you'd make a fish box and then you'd find a place to put the foam. You'd stick the foam wherever you can to give you the floatation. 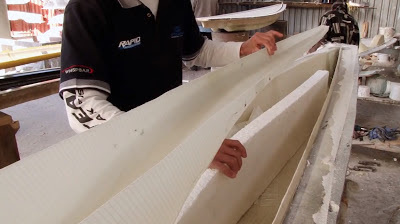 What we've done with the Pro Fisha range is that we've cut and shaped the foam around the design of the internal hatches, and used it as a strengthening and as floatation, so now the foam is dual purpose. We get two jobs out of the one item. And that's what allows you to reduce the weight. And then with our construction method, the resin and fusion vacuum moulding, using specific cores and so on, all allows you to keep the weight down. How is the interior of the Pro Fisha finished, for example, around the fish box? Basically there's three parts to that kayak. There's a top, a bottom, and the fish box. You turn the fish box upside down and join it to the top deck of the boat. It's glued and fibreglassed on the outside, so you can't see it from the inside, but it's done from the outside before you close the kayak and you join the two pieces together. All that bit is completely watertight? Er, it's never completely watertight but generally it's 95%. It's fibreglassed around and there's a sealing layer on top, we've never had an issue of it leaking through there. You can imagine... the remains of fish leaking into the inside of the kayak..! Yeah it happens occasionally, but generally from a guy getting a crack in his hatch or something, never from just normal use. How easy is to rinse and clean the fish hatch? Oh, easy. You put a hose in there, rinse it, pull the plug and drain the water and you're done. Fish box going into a Pro Fisha with the supporting foam stringer underneath. Great. Another question from jasondstub: When's the tackle tray coming out for the Pro Fisha? [laughs] Never! The tackle tray fits on the Supalite range, because it's got a flat deck, so it's easy to do two rails and a sliding tray tackle system. 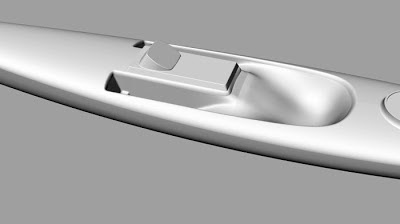 Whereas the Pro Fisha's got a curved deck and a raised profile in front of the hatch, so it's pretty difficult to get something to fit that and work easily. Another question from jasondstub: does the fibreglass box that comes with it also fit the front hatch? Sorry guys, this was an early prototype that didn't work out. Forum user wild321 also wants to know if there is a bait box / live bait box available for the front hatch / tankwell? We have a live bait torpedeo that we sell, that clips on the side, and you hang over the side of the kayak. We have the collapsible buckets, then one of the guys who works for me has come up with converting his bait box into a live bait box that runs off a foot pump. It runs off a whale foot pump, and you put the whale pump under your heel, there's a pipe in the water there, and one that runs to your live bait box, and while your paddle you give a pump every now and then with your foot and it recycles the water as you paddle. Nice idea. Many anglers like to add fish finders & transducers, GPS units, etc. How easy is it to do this with the Pro Fisha? It's very easy. All the kayaks that we're sending over [to the UK] have a battery box fitted inside the hatch. It's a little box that you can put a small battery on, so it's a shelf with velcro, so the battery's out of the way. When you unscrew it you have access to the hull of the kayak. The fish finder's tranducer you can now mount to the hull of the kayak. It shoots through the hull of the kayak no problem. You keep all your excess cable there, and then obviously just run the cable behind the battery box and you mount the finder on the lid of the hatch. Flush mounted lid for a fish finder - ideal for keeping its plugs protected from spray. We've got two types of lid. We got the standard lid, where the guys make a removable velcro plate and they mount the fish finder onto the plate and you can undo it and connect it whenever you want to use it. Then we've got the flush mounted lid. Basically you cut a hole to recess the fish finder in the lid of the fish hatch, so that the wires are inside the hatch so they're protected from water spray on them. I've basically had one on my kayak for over a year, and I haven't had any issues with it. I put the plugs in and I sealed the plugs, and I've left it like that and I'm still using it 100%. In the past, we always use to notice that once the plugs got wet, you'd have to keep cleaning them and you always get a lot of corrosion and they'd just stop working. I haven't touched my finder in over a year and it's still working perfectly fine. So how would anglers get that? Is that something they can order from you? Yeah, or you could ask Chris [Alers - the UK agent] for it. It's called a flush-mounted fish finder lid. On our website, er, our accessories page is... non existent! Yeah, we're busy revamping the website, especially the accessories to make it more of an information portal. So let's say you've got a livebait tube on the accessories, they'll be a YouTube video on how to use it, and photos to click on, so that's what we're trying to do. Who came up with the idea of the rod rack in the hatch? We did, because we were worried about getting fish slime all over our reels! That's one of the reasons, well, in the Evolution range, what you call your rod chute is from the top to the bottom. My idea, when I discussed it with my dad, is that all that space above where your rods go is just wasted. So, using all this fibreglass, that's heavy, and it's wasted. So I said that maybe we should make the hatch curve up, and put the rods up, then underneath we can put the polystyrene foam as your stringer, which as I was explaining earlier gives your buoyancy and strength, so you get the same strength, like a... strengthener system, and then what would be nice if you put a little rack in there it would keep your rods up, out of the way. Thinking out of the box, as they say! Rod rack bar inside the the front hatch. Keeps your rods safe and your reel free of fish slime. 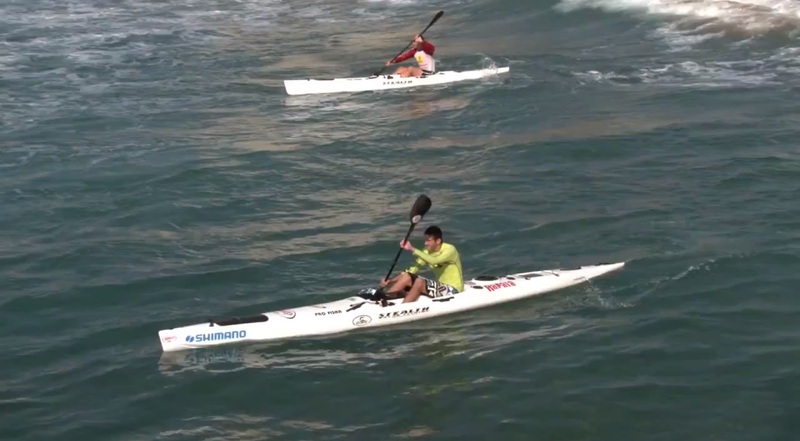 Is the Pro Fisha generally considered a comfortable kayak to paddle fit long periods? Or do most anglers fit seat rests? Yes, it is. One of the key factors is that your feet are lower than your bum. You can sit with your feet lower than your bum all day. As soon as you raise your feet, your back will take some strain. So you'll obviously need support. Yes, backrests do make the kayak more comfortable, it definitely does, and we've got several types. Forum user wild321 wants to know why a back rest doesn’t come as standard with the kayak? Purely because not everyone wants the same backrest. And we've found that the kayak is comfortable enough not to use a backrest, but it's something you can add afterwards if you want to. Really, so there are quite a few people who don't use them at all? Er, you probably see 2 backrests to 7 without in South Africa, elsewhere maybe 4 to 10. So 4 will have backrests and 6 won't. A couple of the seating options available from Stealth. You can see more info here. And finally, the last question goes to jasondstub: What would be the one kayak in the Stealth range you would have if you could only have one? Tough question! Right now, for the type of fishing that I'm doing... I like to use the 475, for the ease of being able use it before work, it's so easy to load it on and off the car on my own when I'm fishing before or after work. But I love the 575 for the speed, and I just love the bigger kayak. If I'm fishing with someone, then it's the 575 every time. But it is just that little bit bigger when I'm on my own, and the 475 is a little bit easier to handle and manage. It's a toss up. Oh no, I generally fish on my own and I've ordered the 575!! No, you'll be fine, I promise you! I've been using a 575 for over a year now with no problems at all. But as I have the option to use something that's a little lighter when I'm on my own, then I'll take it just because it's there. But I wouldn't sacrifice the speed of the bigger boat, I can pull lures more comfortably, and I love the relaxed paddling of the bigger boat. Yeah, there's a lot more pluses for me with the 575 than the 475, but the 475 is more about convenience at the moment. OK Brett, thank you so much for the taking the time out to do this interview. I'm sure it'll make fascinating reading for anyone thinking of purchasing a fibreglass fishing kayak, and a Stealth kayak in particular. Well folks, I hope you enjoyed that! It was fascinating talking to a guy who not only really knows his way around kayak design having raced professionally, but who is also a committed kayak fisherman. I'm sure some of his comments about the design of Stealth kayaks will provoke further discussion. Whatever people think ends up being the best kayak to fish from in UK waters, having a major kayak builder like Stealth entering our market can only be good thing for all us! Please leave me any comments you have about the interview. Great Post !This is an assumption and it’s false. Well, some models can be tippy of course. But there are several other kayak models that are extremely stable. 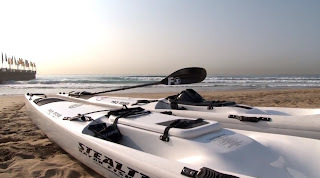 You’ve to select a more stable one for you to enjoy kayaking, and also learn a couple of brace strokes and how to relax the hips when kayaking.